← Now, Listen to this! Once upon a time there was a little boy named Cody. (I am working under the assumption here, that the reader understands that ‘once upon a time’ predicates that what you are about to read is fictitious–a compilation of many different kids simply used as examples).Cody lived in an upper middle class suburb with his parents and his four siblings of various ages. Up until a few years ago, Cody was a happy, well adjusted kid who played in the neighborhood and went to school on a regular basis. But then Cody’s Dad lost his job when the economy went south and his mother has been trying desperately to juggle the bills on a zero income budget. Cody’s parents are dealing with other problems with Cody’s siblings so he is somewhat left to his own devices on most days. As things got worse at home, Cody began to retreat into a world of fantasy and anger–emulating the world around him. He was suspended from school for carrying a knife into his middle school building. Susie lives on the other side of town. Susies’ parents are recently divorced and her mother was just diagnosed with lung cancer. She hates spending time at her Dad’s apartment because she doesn’t particularly like his new girlfriend but since her Mom is so sick with her treatments it is necessary for her and her little brother to sleep at her Dad’s more often. Sometimes Susie cuts herself ‘a little bit’ just because it makes her ‘feel better’. Susie skipped class a lot and spent many of her high school hours in the girls bathroom, away from the inquiring eyes of the teachers, who Susie thought hated her as much as her Dad did. Joey comes from a 2 parent-2 job family that from the outside seems quite “normal” . Joey is an only child, who spends a lot of time alone because his parents both work late hours. He is very lonely and gets scared in their big house but wants to feel like a man so he never tells his parents about his fears and would usually stay up very very late until they got home. Joey ‘s parents were called in because Joey was continuing to fall asleep in his 5th grade class and not doing his homework. 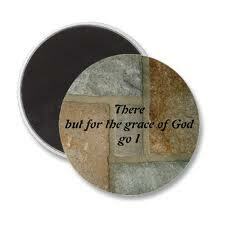 My mother had a saying among her repertoire of cliches–“There but for the grace of God, go I”. This she mumbled quite often over the years. She would say this whenever she saw a fellow human in despair, down on their luck, someone worse off than herself. It’s really just a fancy way of saying “better you than me.” Oddly, she had enough of her own problems to fill a whole church–dragging seven children through adolescence she saw her share of drugs, alcohol, car accidents, skipped school, police visits, fights and failures. Enough that would have given our neighbors reason to mumble their own form of thanking God when looking at our house. When I was first married, before I had children, I was adamant about how I would NOT raise my children. I preached to my childless friends that I would do it differently than my own parents, and how other parents I knew were wrong in their approach. I would be aware of my kids at all times, always there for them and ever-present to their needs without spoiling. When my first son was born, I thought I had it all figured out. I would pay attention to everything he did, take him places, expose him to museums and culture, keep him busy, love him, hold him accountable–basically do everything, RIGHT. Sleeping? Well, only lazy parents let their kids sleep with them. Eating? Only fresh home-made baby-food for me. Diapering? Cloth of course. This is a wonderful ideal, and exactly, I believe, what all new parents set out to do. And honestly it’ s easy to stay under this umbrella of maternal righteousness until life gets in the way. By the time my second and third child came along my kids were eating french fries in their Pampers as they crawled into bed with me. But they were right. These little kids that I could mould and pursude, grew into super-sized teenagers with ideals of their own, often quite different from mine. At some point over the years as my kids grew I changed my attitude from thinking I was the only one who did it RIGHT, to thinking I was the only one who did it WRONG. There were times, looking around, when everyone elses kids seemed to be on the right track while mine were still waiting at the station. Extracurricular activities began to pile up in my attempt to keep up with the Jonses, and the Smiths, and the O’Mally’s. “Why can’t you be more like, Timmy,” I’d say, in an attempt to guilt my son into joining the debating team in his spare time between hockey, work, and school. If Timmy can do it why can’t my son? His parents must be doing something right. Why were their kids so focused and mine were not? Why is my daughter so rude to me when her little friends seem so nice to their own moms? How come Judy’s house is spotless and mine is a mess? The danger in this kind of thinking lies in it’s opposition. If I allow myself to believe that others are doing it right and I am wrong than my only chance at survival is to seek out parents who are doing it even WORSE than I am. Look for those families in crisis whose kids are being singled out for “bad” behavior, so I can justify my own parenting skills. Luckily, not only did my kids get older, so did I. And now I have become like those yucky old ladies in the grocery store. But here’s a grand secret–with age comes wisdom–great comforting wisdom that creates peace within. My wisdom has come in the knowledge that parenting skills are not singular–there is no Right way to do it, every household situation is different. I have learned over the years that all kids will eventually screw up. Now or later. And that it is a dangerous proposition to assume yours will be the only one that doesn’t. If our own family is in crisis, we close the curtains and try to deal with it quietly without asking for help. We are ashamed of our failures–many of which are just life beyond our control. The same crap our parents had to deal with, but we thought we were better and stronger than they were so we hide our heads in shame. If, on the other hand, we are at a point when things are running smoothly (and guaranteed that won’t last forever) than we justify everything we have done right by how well behaved and perfect our children have become–thanks to our perfect parenting skills. But what about Cody and Susie and Joey? What happens to them? There is much suffering and struggle that goes on behind your neighbors’ curtains. It’s time to start knocking on doors and offering help. It’s time, as my mother would also say, to “get off your high horse” and show some compassion for other’s who are having a hard time. It’s easy to sit back and judge other’s for their missteps, much harder to put yourself out and make a simple phone call. It’s quite possible that what you fear might work in reverse, that your own child’s good behavior, that you have worked so hard at maintaining, might actually rub off on someone else in need. It’s time. This entry was posted in Uncategorized and tagged compassion, parenting. Bookmark the permalink. by golly i think we’ve got it. will talk more about this to u personally. nice writing and right on the nose.